Letters from You…we love Mortimer! Some readers will always remember Joan Aiken for The Wolves of Willoughby Chase, or her heroine Dido Twite in later books in the Wolves series, but many of the letters that still arrive from her fans are about Mortimer – the ‘feathered fiend’ who worries the life out of Mr and Mrs Jones, a taxi driver and his wife who live in Rainwater Crescent, London NW3 1/2, but who is besottedly beloved by their daughter Arabel. Somehow she always sees the right side of him, and in return he would do anything for her. Here’s a lovely letter from a fan so devoted to these stories she’s even used them for her email address. I am writing to you because Joan Aiken’s books are amazing! My love for her books all started when my mom was a kid and was sick in the hospital. My grandad bought Arabel and Mortimer and read it to her to cheer her up. She really loved the book and kept it until she was an adult. 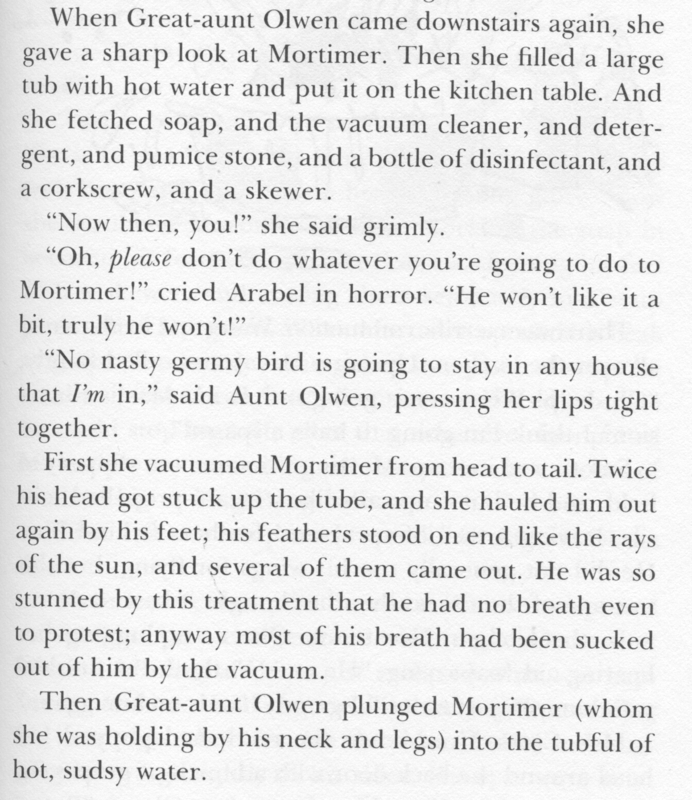 When I was around eight, my mom read me Arabel and Mortimer. I loved it so much, we got the whole series. In fact, my email address is inspired by Arabel and Mortimer! One time, when my parents and I went camping, my Mom had to go to a store next to the campground because we were out of milk. When she came back to our car, she said, “I’m so glad there aren’t any RAVENS here…..” at that moment she made a weird noise and threw a black thing into the backseat. I picked it up and looked at it for a moment. Then I said “Thanks Mom!” because the thing that she threw back to me was a stuffed raven. She asked me “What are you going to name him?” and I said: “Mortimer.” and I’ve had that silly bird ever since. 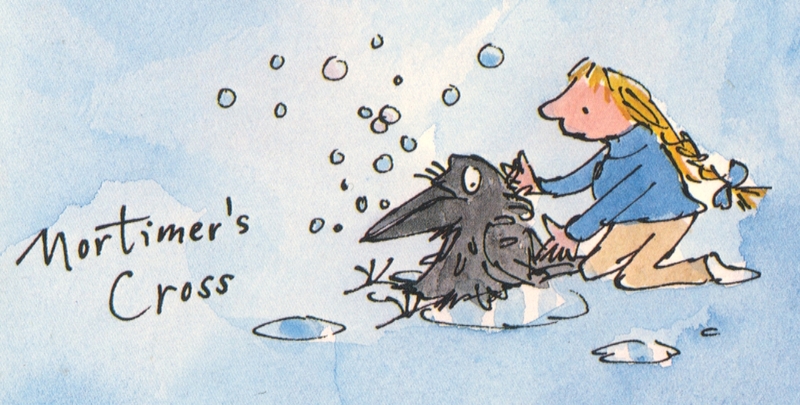 In the book Mortimer’s Cross, Mortimer has a special box that is labelled Mortimer’s Cross, H.A.R.R.I.S (Hush, A Resting Raven’s Inside! Shh!). Arabel’s Great-Aunt Olwen mails it off by accident, thinking that it is a box with the same address with clothing inside! I have re-created that same box and Mortimer likes to sit in it. We also read The Wolves of Willoughby Chase, and loved it. So now we are reading Blackhearts in Battersea. Joan’s books have made such an impact on my life, I just really wanted you to know how special and funny they are! Many more letters ask where, oh where can they get hold of the CBBC TV Mortimer and Arabel series that came out in the 1990’s? Where indeed! Let’s get up a petition for a reissue! 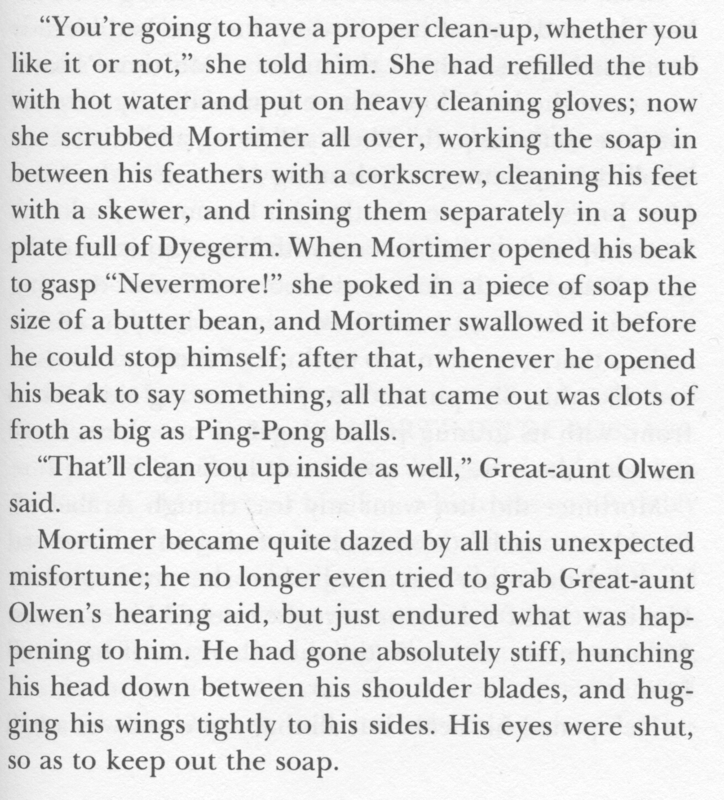 Unfortunately for Mortimer, when Great Aunt Olwen comes to stay, it means just one thing… Spring Cleaning! But Mortimer ends up on top of the world – quite literally! – broadcasting for help to outer space, and of course Arabel comes to his rescue, in one of Joan Aiken’s last stories about the small girl and her enormously difficult raven – Mortimer’s Cross – a book sadly outof print at the moment,but fingers crossed the pair may soon be back! 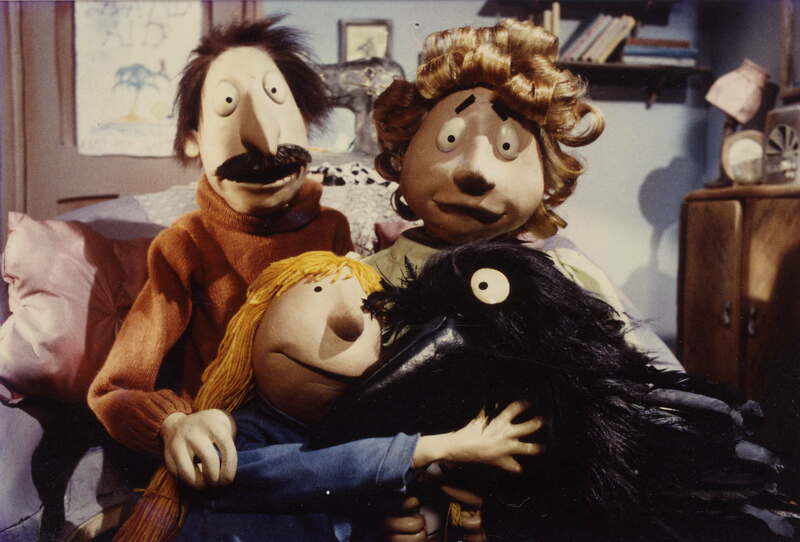 Mortimer the Raven – an unexpected hero! More famous for munching up flights of stairs, and even escalators (where do you think the word ravenous comes from?) 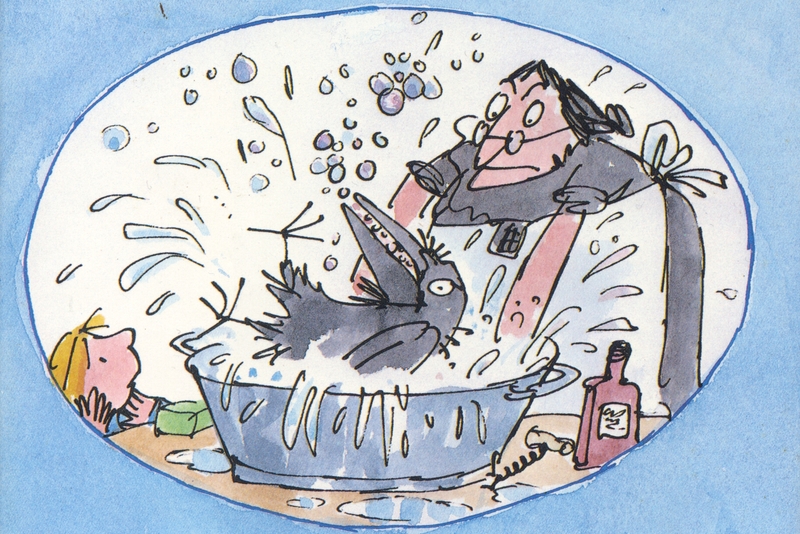 Mortimer the raven, best known as a hilarious troublemaker in Joan’s series of stories about the Jones family and beloved friend of Arabel, is surprisingly also a hero with teachers of reluctant readers. Here’s a letter from one of them, thank you, Anne!